Taking the brunch game to a whole new level today. I honestly don’t know why it has taken me so long to jump on this whole tacos-for-breakfast thing. Now that I’ve tried them though? Whoa, I am so hooked. 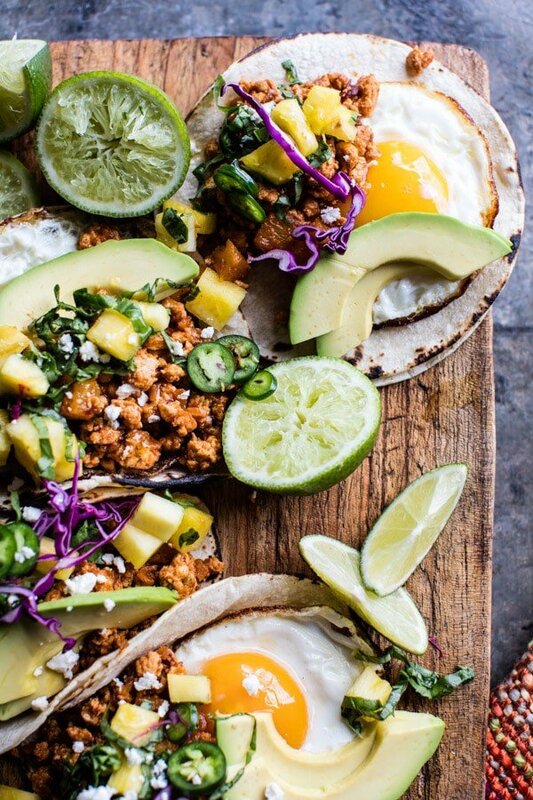 I mean, what on Earth could not be awesome about having tacos for brunch? They’re the best. So let me tell you a little back story on me and tacos. Yup, another story! I’ve been eating tacos for as long as I can remember. My dad would religiously make tacos at least once, possibly even twice, a week for my brothers and I. He’d make beef tacos, wrap them in flour tortillas for the boys, and stuff them into hard shells for mom and I. We’d top them with cheese and lettuce and call it a day. They were pretty bland, but my family loved them anyway. I don’t think anyone ever complained about having tacos at least once a week. They were just so freaking simple, but still a true crowd pleaser. Anyway, it was clearly only a matter of time before I tested out brunch style tacos…and now that I have experienced their amazingness, today is the day I’m sharing them with you! So I did a lot of research on breakfast tacos, and you know? There are a lot of them out there. Like a lot. 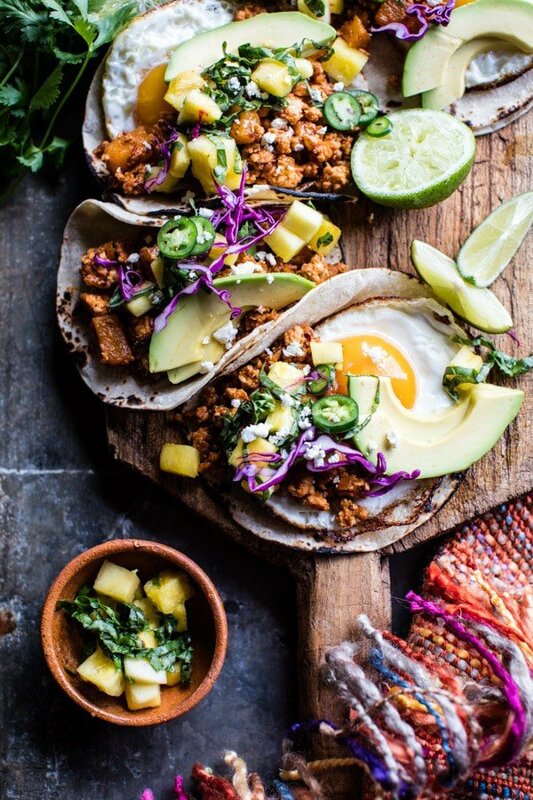 I wanted to do something a little different, so I created these al pastor style breakfast tacos. 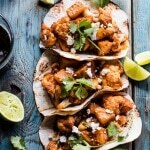 Tacos al Pastor usually consist of pork that is slow cooked in a spicy orange pineapple sauce…SO good. But instead of slow cooking the pork for hours on end, I took a bit of a shortcut and went for ground chicken. It’s a little lighter and leaner, which I felt was kind of a good thing for a brunch recipe, you know? 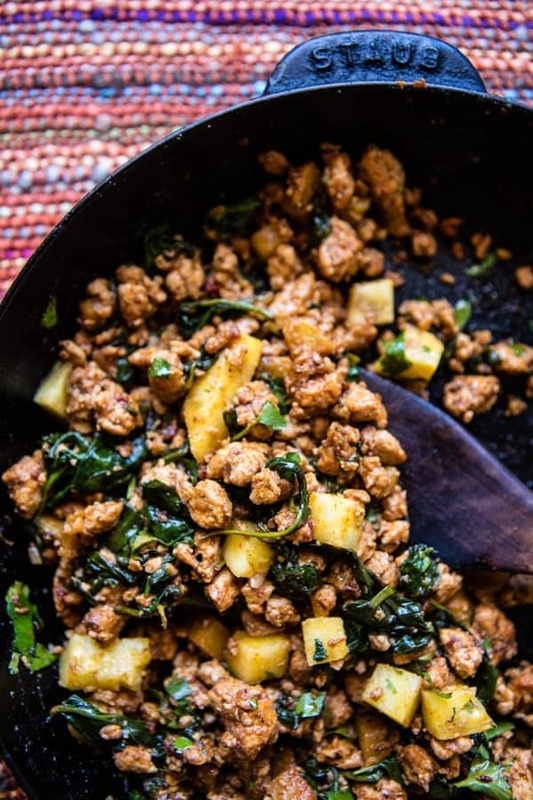 You could also use ground pork or even turkey. 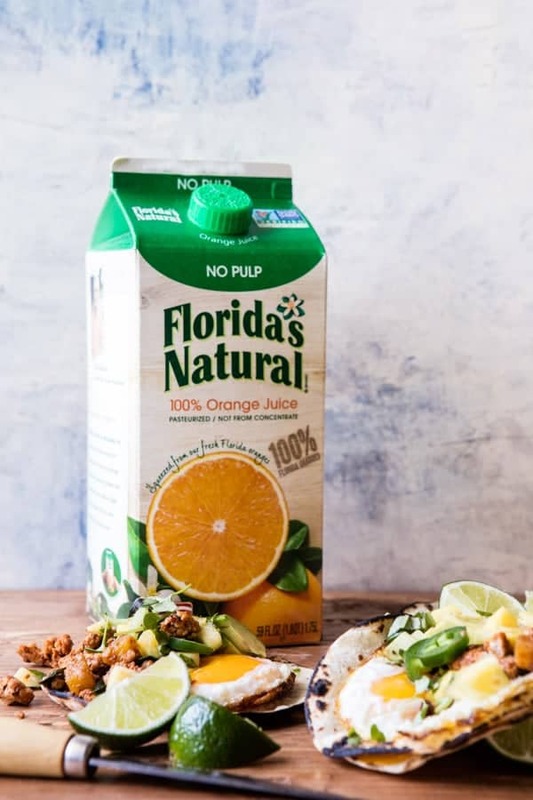 For my sauce, I totally kept it al pastor style, with tons of pineapple, some chipotle peppers and a good splash of not-from-concentrate Florida’s Natural® Brand Orange Juice to balance out all the spice. 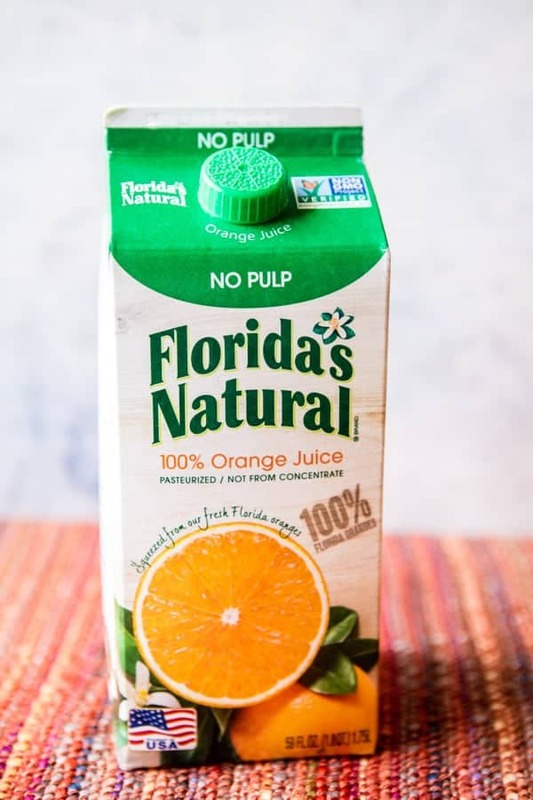 (Not only does it add that necessary citrus flavor, but it’s also made entirely from Florida oranges, which I can totally get behind.) But this filling. I cannot tell you enough how delicious it is. 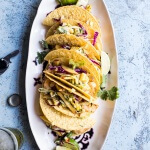 It’s packed with the sweet-and-spicy flavors of classic al pastor style tacos, but yet so simple and quick. The orange juice is key here, as it adds a really nice punch of citrus, which fits perfectly with the pineapple and smoky chipotle. Now, what is a breakfast taco without some eggs? You just have to have them, right? I couldn’t decide if I wanted to fry my eggs or scramble them, but in the end, I went with fried, because when in doubt, I always go for the runny yolk. <–it’s my favorite! Then, just finish each taco off with some fresh pineapple basil salsa, cheese and avocado. Yum, yum, YUM. Since we’re talking brunch, you should probably include a special brunch drink. Maybe something like this orange turmeric crush? Yes, I think that would be perfect. And lastly, these would be great for a Cinco de Mayo brunch or even as a super fun way to spice up Mother’s Day! Bring on the all the breakfast tacos! 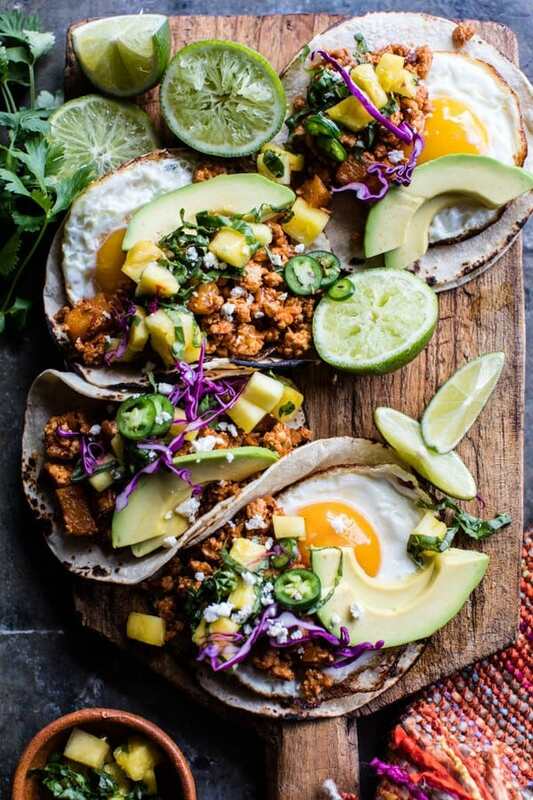 Breakfast tacos to spice up your weekend brunch! 1. In a large skillet, heat the olive oil over high heat. When the oil shimmers, add the ground chicken and onion. Cook, stirring often and breaking up the meat as it cooks, until the chicken is browned, about 5 minutes. Add the garlic, chili powder, paprika, salt, chipotle peppers, Florida’s Natural orange juice, 1/4 cup water, and 1 cup pineapple. Reduce the heat to medium and simmer until the sauce has thickened slightly around the chicken, about 10-15 minutes. Remove from the heat and stir in the cilantro. 2. Meanwhile, in a bowl, combine the remaining 1 cup pineapple, the basil, jalapeño, lime juice, and a pinch of salt. 3. To serve, divide the fried eggs among tortillas and top with the chicken. Add the pineapple-basil-salsa, avocado, and cheese. EAT! Ahhh! These look gorgeous! I know… I’ve not had a bunch taco yet either. Imma gonna change that ASAP! Styling and recipe is on point as always! I just showed your post to my niece’s husband here in Germany. Tacos are getting very popular with the young crowd. I love all the ingredients in your tacos, yum! 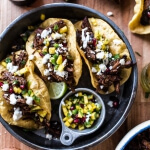 Holy mother of tacos, these look good! Currently sitting at my desk waiting for lunch time…these are making me even hungrier, great recipe! Sounds like you needed some tacos! Hope you got something yummy! 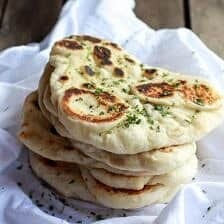 I seriously want to try every single recipe you make! I wish you could have them! Thank you! Awh that sound so so fun!! Taco trucks are the best! Doing a 5k on Saturday. 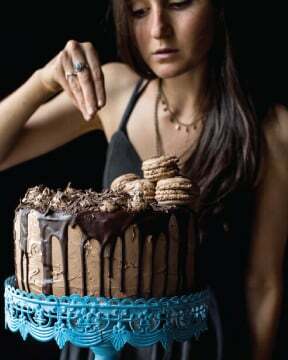 Will be making these when I’m done. I think they might just get me to the finish line faster! These look fantastic. A lot of work for the morning though…I may make them for a “breakfast for dinner” meal. Maybe prep and make some of it the night before for brunch? And since I’m not a big meat eater, I’d sub black or white beans. Hey Janine! Love the idea of subbing black beans, that sounds incredible! And yes, you can prep the night before and then just warm in the morning and fry the eggs! Let me know if you have questions. Hope you love the tacos! 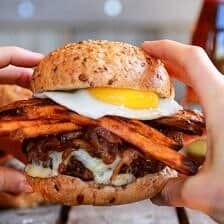 I love unique breakfast ideas and this is perfect for the weekend. It’s filling and a great way to start your day. Can’t wait to try it! Agreed, I love breakfast but need some different ones! Hope you love this one! 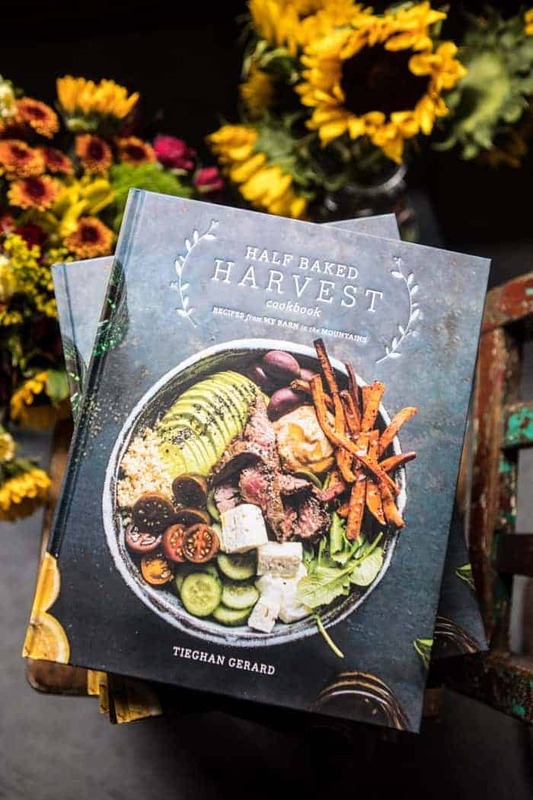 These look so good, Tieghan! Love all that fresh citrus! I am so excited about this. All of my favourite flavours in taco form. YUM! Will definitely be making these ASAP! YAY, hope you love them Kate! Thanks!! I think mango would be amazing!! Sound delish. Let me know if you have questions. Hope you guys all love these! Oh Boy! Your poor dad! Bless his heart for making you all those tacos. I’m sure they were tasty. . .as a matter of fact he can come make tacos for me any day because they happen to be one of my all time favorite cheat foods (along with nachos). 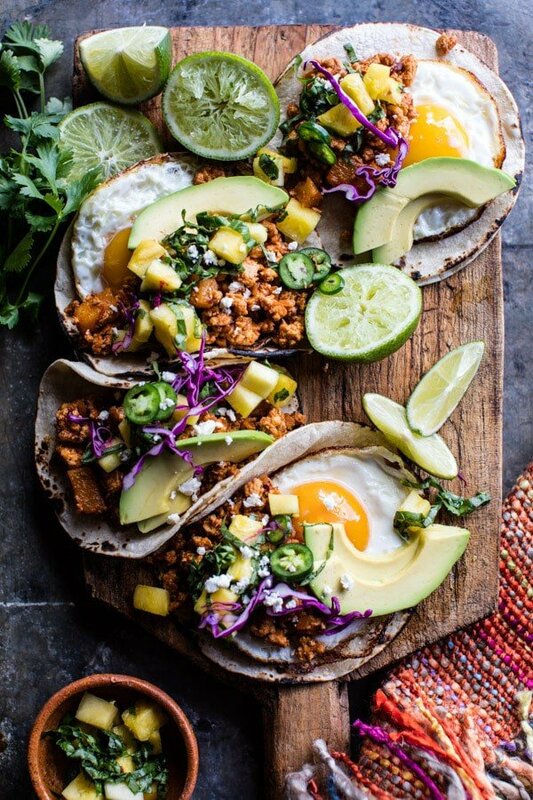 Loving that you have given me yet another way to squeeze more tacos into my life …I mean breakfast!!! 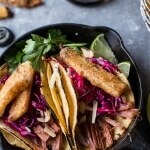 Tacos for brekky, lunch & din din. . .now that’s my idea of a perfect world. Tacos are the best cheat foods no doubt!! haha Breakfast tacos are a must. So happy you like them Lynn, thank you! Seriously yum, this is the best way to do brunch! Breakfast/brunch is one of my fave meals. . freaking LOVE these! Killer breakfast tacos Tieghan! I could eat these for any meal of the day! Yay, so good to hear you like them Mary Ann (: Thank you! 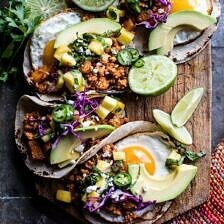 I am 100% in on tacos for breakfast, especially these! YES!! Same, love that you like them, thanks Matt! 1. Their OJ is the BEST 2. These tacos are the BEST! The other day we ordered quite literally the most gelatinous gross breakfast tacos with our coffee the other day. These look the absolute opposite of that! These look so so good!!! YUM!!! Sound like you needed these! So happy you like them thank you Maria! an ex-boyfriend of mine gave me a hard time whenever i would mix separately cooked chicken and eggs together in one dish—he thought it was bizarre. 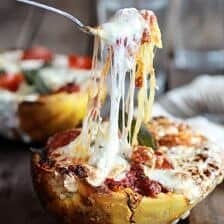 seeing this delicious looking recipe and no one commenting on the two used together makes me feel normal for wanting to combine the two. Haha, what a funny thing to think is weird! I love the two! So I turned this into breakfast burritos with larger whole wheat tortillas to meal prep for the week!! Threw a few in the fridge and the freezer rolled up in tin foil. And YUM! Just ate one to start my day. I love what the OJ and pineapple do to sweeten up the chili powder. One of my favorite breakfasts!! What a genius idea! Sounds amazing!! Thank you Libby! As always, you have the most beautiful food on the web. I have made several of your recipes, they were incredible, but this one just didn’t have the usual “zing.” I couldn’t figure out why it was just “meh,” but then I remembered that fresh pineapple alters your tastebuds. It has an enzyme called bromelain, which is great for tenderizing meat, but bad for the buds. Some people are especially sensitive to bromelain and they get an itchy/burning sensation on their tongue when they eat pineapple and nothing tastes right for the rest of the day. The pineapple salsa was delicious ( I never would have thought to put basil in it). Maybe you should recommend making it with canned pineapple as the cooking process breaks down bromelain. Wow, I did’t know that, thats a great idea! Also so sorry if it burned your buds!! I hope it was still enjoyable Heather! Thought you should come up with a way for readers to save your recipes easily … and then I saw that you already had! 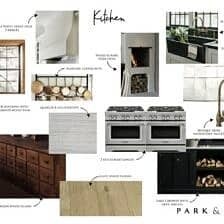 I saved this to “Big Oven” … and wondering if you use their service or if you have another place to save recipes online. Note, Meanwhile, in a bowl, combine the remaining 1 cup pineapple, the basil, jalapeño, lime juice, and a pinch of salt. Seems like a great way to do it! Thank you! Ah well I hope you love them all if you do haha! Thank you & enjoy! That is great, but I think they both taste really good! The food is great and not hard to do! Thank you for sharing how this dish came to us! Wow i love tacos so much is my best dinner ever i eat it good job and good share. Awh thank you so much! I am so glad you like this and hope you try it! This dish is unique, and I also want to try it, thank you for sharing the way.